LE : Ronny, which are your favorite 80s new wave groups ? Musically, do you prefer those years more than the 90s onwards ? R.M. : In the 80s I used to like the sort of standard bands in that time, Bauhaus, Virgin Prunes, Cocteau Twins, Siouxsie, Cure, The Sisters, Cameleons, Bunnymen, Theatre Of Hate, Eyeless In Gaza, Black Flag, The Comscat Angels, etc. Also the Netherlands produced influential bands who made quite an impression to me, like Mecano from Amsterdam, Nasmak from Eindhoven, Coitus Interuptus from Utrecht, Minimal Compact etc. and ‘famous’ local bands from Nijmegen like Mechanic Commando and Vice. I don’t think anything really interesting came out in the early 90’s but in the end it started picking up again with a whole new wave of new bands which took a more electronic direction and moved on instead of looking back. In that perspective I like it now way better because there are many, many indie labels doing basically the same as in the early 80’s; setting themselves against the mainstream culture of MTV and the likes, the idiotic fabricated boy/girl bands, rap hoodlums, smurfhouse styles and everything else which is aimed at the Mac Donald addicts. Because we also organize the GothAM festivals in Amsterdam we book predominantly bands from the current scene. Personally I find the music made today more exiting and there is no reason for looking back apart for the factual reasons of history. The only downer now is that too many bands get into problems by the home copying of CD-R’s in the thousands per record sold. 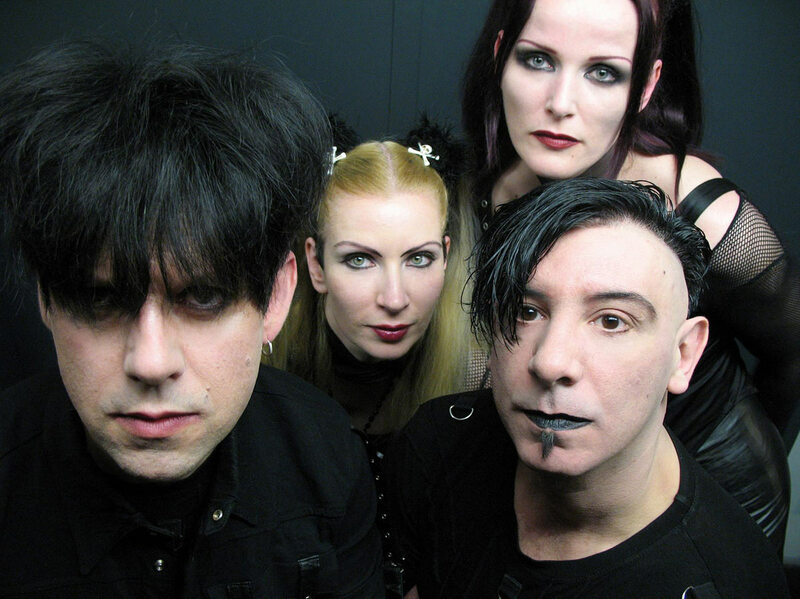 LE : Could you describe, with just a few words, the style of Clan of Xymox in their different eras ( Clan of Xymox, Medusa, Subsequent Pleasures, Hidden Faces, Creatures, Notes from the Underground) ? During which period were the feelings more intense ? R.M : Subsequent Pleasures was an early attempt to make some music and release it myself. I never dreamed that people would be still interested in this after such a long time. Basically it was very badly recorded and the songs were even worse than demos . Still it is a sort of historic document of how I was already shaping up towards making music. From then on things changed a bit, we signed our record deal and never looked back, suddenly we were musicians. The selfnamed debut album “Clan Of Xymox” set in a way the formula already present on Subsequent Pleasures, using and combining keyboards, synths, drum machines, so basically mechanical parts combining them with real live instruments like guitars and a bass guitar. This approach we continued on the Medusa album. Both albums were the blueprint for Clan Of Xymox and how to proceed musically. Both albums were released by the British label 4 AD. knew us. Also in Europe they noticed our band was getting in the bigger league. We got a lot of new fans who had never heard of 4 AD before. The album “Twist of Shadows” sold over 300.000 copies. We played a lot of live dates in the USA and hence got ourselves known. pressure to “score” some sort of top 40 hit. I never perceived the band as a commercial vehicle so that’s one of the reasons the album “Phoenix” was our last on PolyGram. “Hidden Faces” was written over a period of three years with sample material to choose from. I wrote in more different styles and even wrote enough material for an instrumental album. I simply chose the tracks which I liked the best and would highlight different aspects of Clan of Xymox, dark wave, industrial, ambient instrumental pieces and gothic rock songs. It feels more like a compilation of tracks. After recording “Hidden Faces” a different period for me set in, we started playing live a lot and I got more and more aware in which direction I wanted to go and felt most comfortable with. For example the previous album “Creatures” was a different direction to me, the making of a soundscape with nearly all songs relating to each other, in short a very dark album I never attempted with Clan Of Xymox before, to me the most successful album. I guess with “Creatures” that was the mood I was in and I was/ am very pessimistic about people in general. “Creatures” was written in between one and a half year of touring and the writing process is different than the others as each time something occurred or caught my attention, I translated this almost directly into music, thats why it sounds like the most homogenous album recorded by Clan of Xymox ever and as far as I can see also the darkest one to date. You can simply say this was my reflection and inner mood after the release of “Hidden Faces”. With “Creatures” I stuck to same instruments for the whole album, so therefore you get a very homogenous feel. For every album I try to approach things a bit differently so that all albums have a certain character of their own. After having done such an album I found new instruments such as an electric mandoline, vst plug in synths etc. to give me a push in more directions as I went along, I think that is the beauty of getting and letting new instruments into the studio and hence creating different moods and songs. With the album “Notes from the Underground” I felt more in the mood to innovate the sound a bit and using again a different range of sounds. To me this album was to me the perfect follow up, a very diverse album of which I am very proud. After the release of the album “Notes from the Underground ” the idea formed to do something more with it, to ask people to do a remix as we were asked for years why we did not release any different versions of our tracks. Now it seemed the right time because to do a thing like this is now relatively easy with the powerful PC’s around. I asked bands in my direct environment if they were interested to make me a remix, BUT in their own style. I preferred to have no guitars in the remixes so it would sound really different from the original recording. After many enthousiastic reactions I sent the masters away to let bands mix them. LE : Have you noticed any differences between your fans of the earlier years and the present ones? Do you think that people of this music scene are now less romantic than the ones that lived and experienced your music at the first years of your music career ? People always go to see a concert because they like what the band does, so in that sense nothing has changed. LE : Do you proceed with logical follow-ups with every album of yours? Is every release of yours the sound-sequel of the previous ? R.M. : The initial intention is always to make the most beautiful album; the way I go about it is that I never have a clear idea of what direction I will go until I start writing, mostly the sounds I use and like will dictate me as it was in what direction I am heading. The mood is then set very easily and the track starts to take over, dragging me totally into it and giving me the whole mind set to start creating the whole sound scape and mind set. LE : Contemporary musicians substitute the classical way of making music and performing live for more synthetic methods. Are you for the need of guitars, bassguitars, drums, and other equipment other than synths for the formation of your musical creativity? Do you feel synths could do the whole job just fine? Could you give us some info about Xymox’s studio gear setup ? Today my studio is outfitted with 2 Mac G4’s . It is the central point of everything, 2 x 800 MB RAM, which is quite good for running all applications and plug ins. The program I use for all the writing, recording, and mixing is Emagic Logic Audio Platinum, which I absolutely love. The VST instruments I used on the new album were the Emagic ES-1, and Native Instruments Absynth and Pro-53. For the warm keyboard pads I still use the Kurzweil K1000. I simply love the choirs and strings of the Kurzweil. Other synth plug ins I use now as well, I like the EX-24 of Logic, Battery drums, LM 4, Atmosphere, Waldorf, Attack, Claw and basically anything I can get my hands on. My main mic is a Rode NT-2. I record all my vocals with it. It’s a very good quality for a reasonable low price. Everything else I record goes straight into the computer. I don’t use amps at all, Amplitube, the plug in, is a good simulator for amps. For monitors I use BMW speakers and AKG headphones. Reverb and delay. Without them, I would be lost. Most of the effects plug-ins I use are from Logic Audio, but sometimes I download free plug-ins from the Net which are okay. LE : Do you believe that whoever is involved with writing the songs is also the right person to sing them? Do you feel like the context and meaning of the song change when interpreted by someone else …other than you ? R.M. : As you know I write, record, perform, produce and mix all the music, no one else is involved in the making of the record unless I think it would be worthwile to ask someone to do some guest vocals or so. I can’t say that I am the right person to do any of these things, I let anyone else judge that, but that is what I like doing, otherwise there would be no point in any of it, if I can’t express what I want, and the best way to do that is just to do that from beginning to end. In the beginning of the band’s career it was the same, only with the difference that indeed there were more contributions, Anke used to write one track per album and Pieter two, leaving me to write the rest of them. We continued in this manner till the album “Phoenix”. Indeed the “rule” was ‘the one who writes the song sings it’. This obviously did not work too well for us, the different approaches and different musical directions were becoming too great, so I preferred from on that time to write an entire album on my own. LE : Would you like to tell us some things about Gotham ? R.M. : Whilst working on the new album “Notes From The Underground” we sat one night in a bar complaining a bit about Amsterdam, none of the bands we liked were coming here. That night we decided to become organizers. Our first GothAM festival in Paradiso was on the 10th of March 2000 and was an immediate success, it was sold out. All the bands playing were befriended bands we met on past tours, so it wasn’t that difficult to contact anyone. Because of the success, we carry on with organizing once every half a year the GothAM festival. The National Press went totally haywire, printing headlines like -GOTH -IS -BACK or GOTH REVIVAL etc., we could not believe what we read, it was almost like we woke up the Dutch from a long wintersleep. It is enormously gratifying to see the bands you contacted to play on your own night with an audience of over a thousand persons. The festival is organized in such a way that there is always something to do or to see. With most festivals you have to wait for the next band to start which I always found quite boring. At GothAM we have many small acts inbetween bands, video art projection, lots of small shops with clothing or make up stands etc, so basically everything to anyones hearts desire. After the bands there is a four hour dance night with light shows and video projections. I keep now always time available to do these festivals because I can’t imagine Amsterdam without them anymore…. over here we cultivated it pretty well I can say now in retrospect. LE : Are there any specific things that you consider necessary in order for you to be able to create and have the results you want ? Do you need to be in a specific state of mind in order to be able to find inspiration? Or is it just a usual procedure after all these years ? R.M. : I mostly write at night and in the winter — then I love to have all the equipment on. The writing process is never a conscious matter for me, I know I store up a lot of feelings and emotions which I have to write about sooner or later so each album is a reflection of a certain period for me. Often I get inspired by just a single sound which triggers my imagination and makes me visualize some sort of soundscape and a direction I can build towards with other sounds, as soon as some sort of order is shaped into the sound collage it will dictate itself some sort of direction. Maybe a few words will match some chord structures so I get some idea of what I want to write and what words are suitable to match the created atmosphere which sort of triggers my emotional world. The lyrics are based on events mostly experienced by myself or what I have seen around me and of course when you think about all the things you have experienced you will have a lot to write about. inspired or the will to look for interesting bits and pieces. Of course in the past I have tried to write because of a deadline or so but that never worked for me, I rather delay than force myself. To me music has to come from the heart and there is no such thing as dictating yourself to be creative, you have to feel creative otherwise nothing worthwhile will come of it. LE : What would you want to say about Greece and your fans here? You have a big and devoted fanbase at this country. How was your experience at you last visit ? R.M. : We like Greece very much, our fans are very dedicated and we love to hang out with everyone when we are there. LE : Are there any criteria upon which the bands who remix your songs are picked out? Getting involved with a remix is a very risky task, ‘cause the result has to be something that will get the listener’s ear! How do you deal with remixes ? R.M. : We had already remixes as early as 1985 of the songs “A Day” and “Stranger” taken from our self titled debut album on 4 -AD remixed by the now famous John Fryer ( Nine Inch Nails, Depeche Mode ). These tracks never left the dance floor!! Since then we always had some remixes one way or the other but in the late 90’s we stopped doing them because I did not like them anymore. possible for a couple of years since most artist now own a powerful computer being able to remix it at home instead of having to go into an expensive studio which for us nor them would be an option. I knew most of the bands already from previous contacts (you always meet artists on festivals etc.). The reason that most bands chosen are electro acts is that most guitar oriented bands do not have computers which are essential for making a remix. I don’t want to be to technical about it but if you want to send someone a disc they must have the programs etc. to read them as well. To me the remixes show how our songs would have been done if I didn’t get involved at all ( before that I always was present in the studio ), that is for me a very interesting aspect and has a great novelty value for me. Indeed with certain tempos, beats, synths blurting out it certainly will appeal to DJ’s who play up tempo tracks at their club night. I have seen already the reaction on the dance floor when DJ’s played tracks from the remix album and it certainly works for everyone! So far I only heard very positive reactions from our fans….. LE : You are particularly interested in the sound of other groups. What is a good way to support a group that in your opinion shows signs of potentials? How would you promote the band to the public if you really believed its sound is special and the band promising ? R.M. : That is pretty easy for us now to help and devellop a promising band, I run a ( small ) label so if I like something I can sign them and release them through a licensee’s label. Also, we can book bands for the GothAM festival as well, giving them a platform to reach people. LE : You are considered to have a very important history as a band. How easy is it to update your music through all these years? How easy is the transmission from one music era and its trends to the other ? R.M. : With my music as you know I am not rigid in my choices. Apart from Gothic I also like EBM/ Electro, I always did, so I also touch those styles and them use in my music. I think the trick is to combine several elements to make a style of your own and most importantly to follow your own taste and nothing else.. which of course like everybody else, changes during the years. so it will always sound different than the previous released album. LE : What could you tell us about the forthcoming album? “There’s no tomorrow” sounds great and very promising for what we can expect. Could you give us any titles or other info about the new cd ? R.M. : We did some performances this year but not too many because I want to finish writing a new album which I named so far ” Farewell”. I won’t say too much about it yet apart from the fact that again the album is pretty diverse. I still have to compile the tracks ( and mix them ), so after that I will have a better idea which songs are going to make it on the album. For May we scheduled a tour in Germany where we still have to promote the album ” Notes From The Underground”. Also we just had our half yearly GothAM festival in Amsterdam which was extremely enjoyable. Further I spent some time on releasing and preparing the releases of Jesus Complex and Sophya. Jesus Complex is a project of Damon Fries, our sound engineer who wrote the album. I sing on one of the tracks called “Lost In Sleep”. Currently I am preparing the release of a Greek band called Dark Runner and of course thinking already about the next GothAM festival to be held on Saturday 27th of September. The release of the new Clan Of Xymox album is now scheduled for September 6th. LE : Thank you for answering our questions! We wish you all the best for the new album and we are anxious to listen to it.